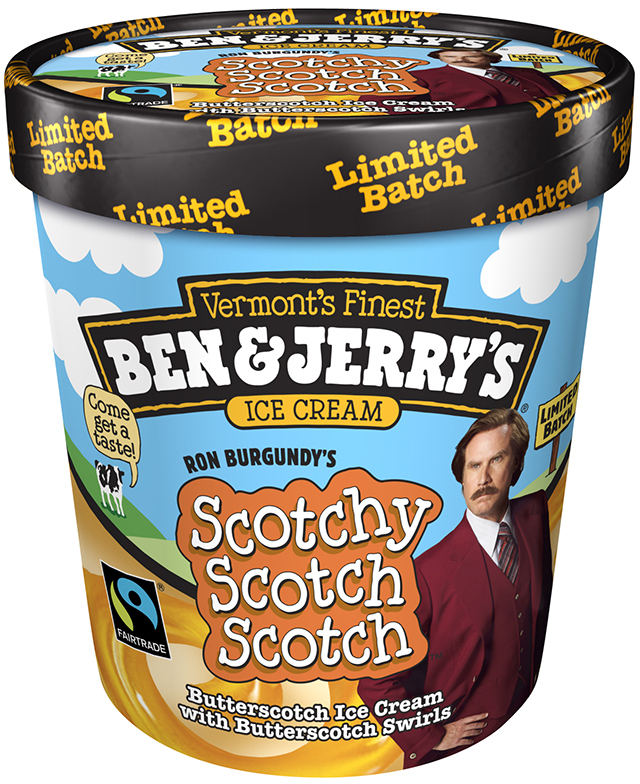 Ben & Jerry’s has released Scotchy Scotch Scotch, a new ice cream flavor based on the upcoming film Anchorman 2: The Legend Continues and approved by the mustached news anchor Ron Burgundy (Will Ferrell). The flavor appropriately consists of butterscotch swirls blended into butterscotch ice cream. We don’t know how to put this but this flavor is kinda of a big deal. Discovered by the Germans in 1904, they named it “Scotchy Scotch Scotch”. Scholars maintain that the translation was lost hundreds of years ago. Stay Classy, From all of us at Ben & Jerry’s.